A new device, that costs just £20 to make, could be exposing a major flaw in the security features of new cars. Professional hacker Samy Kamkar has caused a stir in the motor trade industry by creating the RollJam device. 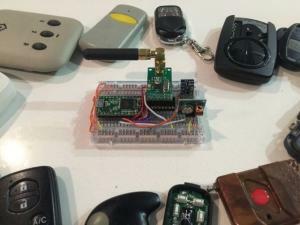 It works by intercepting the codes sent between fobs and keyless entry systems in cars, which allows thieves to access and drive away vehicles that use keyless technology. Stories like this highlight how even with advancing technologies, car dealers must still protect their assets from more sophisticated criminals. A combined motor trade insurance policy will offer financial cover for the value of their stock, spare parts, equipment, cash on the premises as well as the building itself, in case any of the assets should be damaged or stolen. Mr Kamkar recently revealed his new creation to the alarm of many car manufacturers. He explained that RollJam exploits a flaw in the market-leading chips that can be found in cars made by Chrysler, Daewoo, Fiat, GM, Honda, Toyota, Volvo, Volkswagen Group, Clifford, Shurlok, and Jaguar. The keyless entry and ignition systems work by sending unique codes between a fob and the technology installed in the car – by intercepting these codes, a criminal with the RollJam device can get access to the car when the owner is not around and drive it away as if he had the fob himself. The hacker advised that the solution is to ensure that the codes used are only valid for a small period of time.